Manage data binding between datasets and the form’s controls at both directions. The client side infrastructure is described by the following set of components. The request/response manager works with different communication protocols (i.e http) to submit the request from the client and to handle responses back from the server. 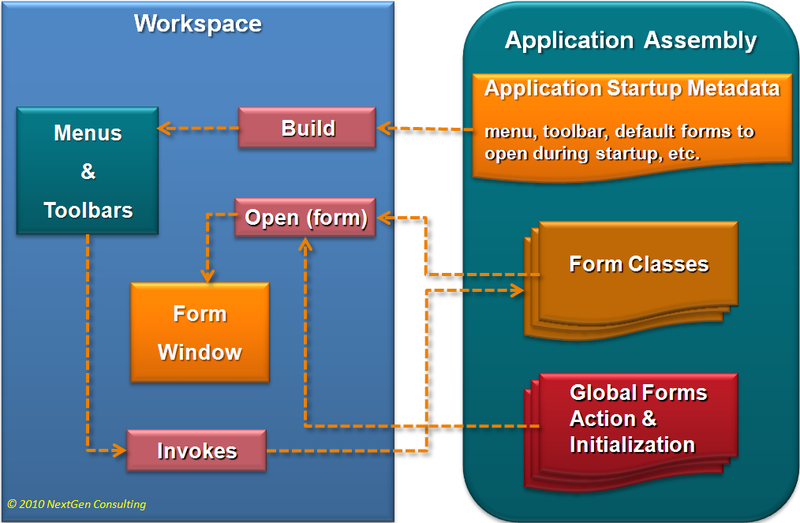 The application object is a script level object that can perform global application tasks like posting modal alerts or expose certain functionality of the workspace. 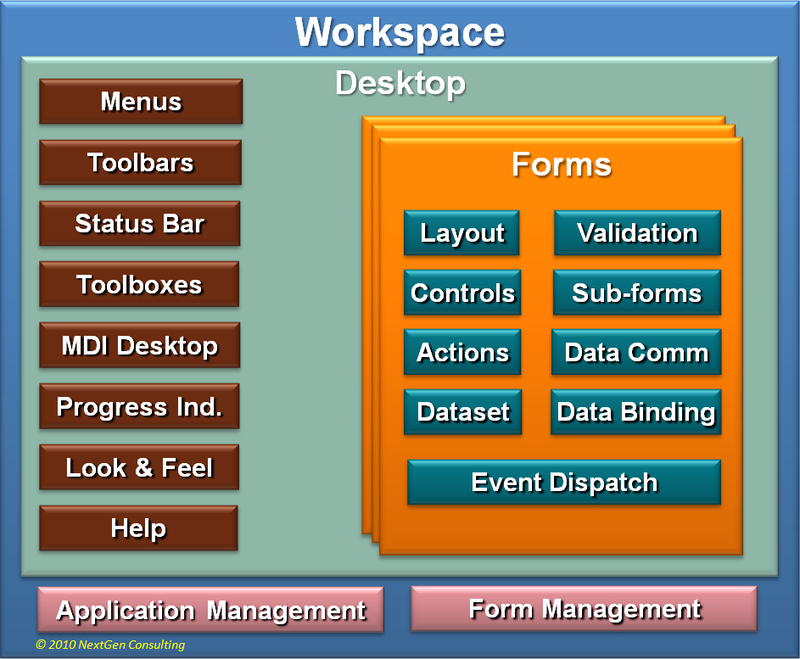 The workspace provides common user interface services to Forms and client side components. Manages forms by providing services to open, close, version, etc. Workspace configuration is XML (workspace.xml). It configures numerous applications and run time parameters, such as list of available application desktops, logging, help, server configuration etc. 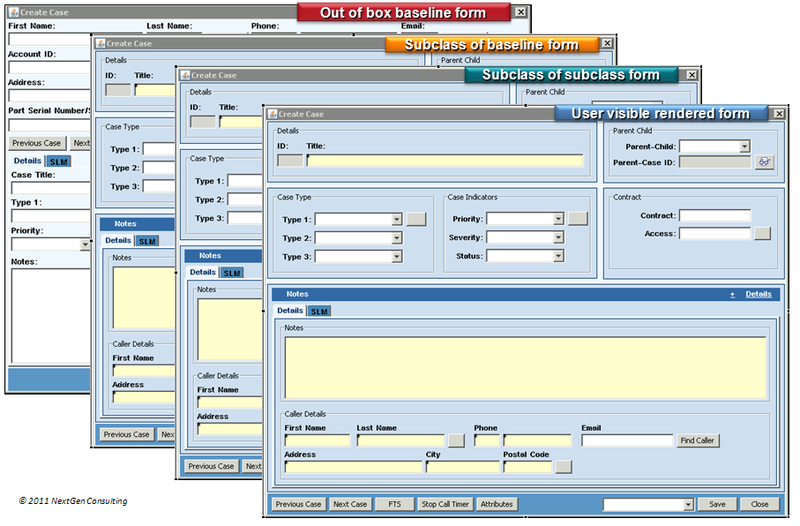 A form is a UI object that represents a business level Form and encapsulates the native implementation of the swing form (JInternalFrame in Swing for example). 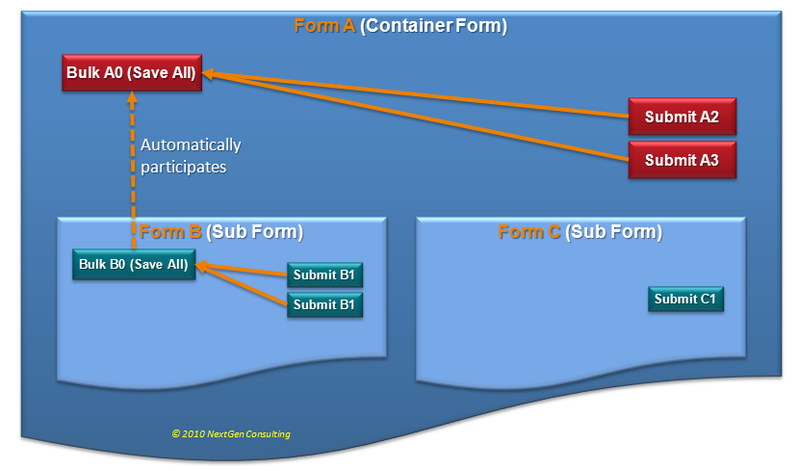 A form usually contains controls and sub forms. 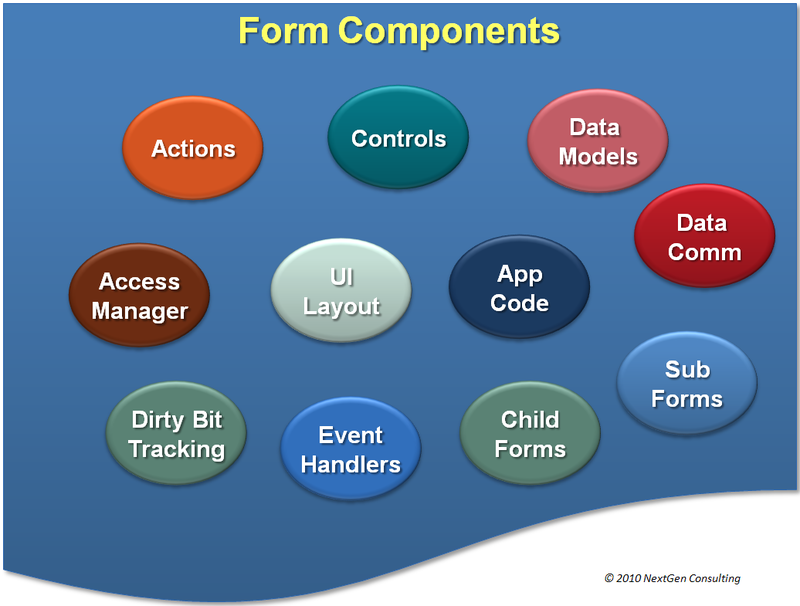 A form manages controls, data models, actions, sub-forms and other components that define the form. 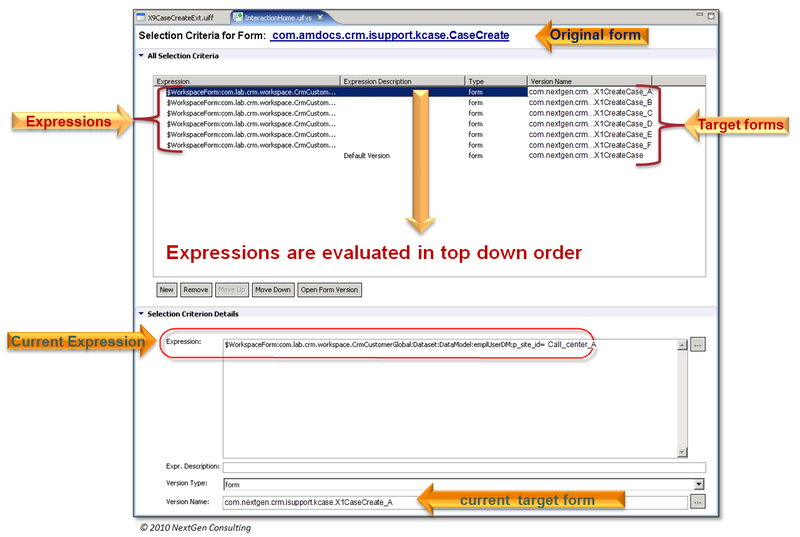 The form supports design tools by delegating content creation to a “builder” class which is generated by design tools. 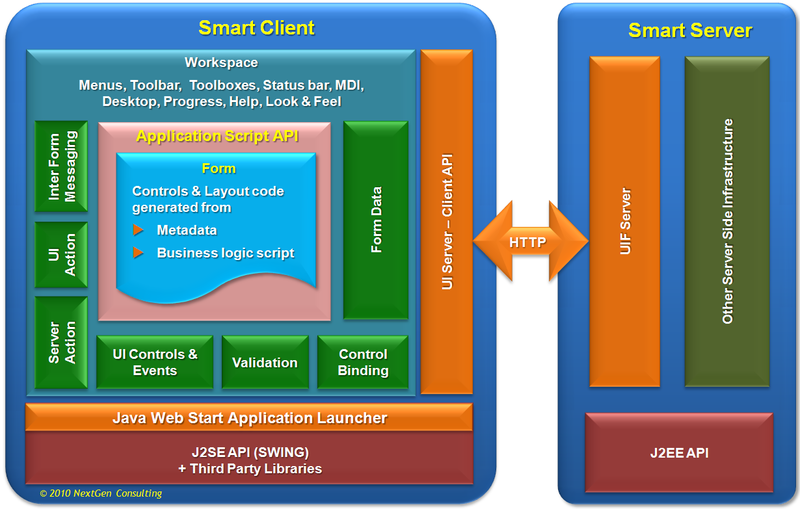 It provides published API for application scripting. Forms can be launched in work area, in the toolbar pane (toolbar), in the toolbox pane (toolbox). A form can be launched in the main work area. A form can be launched as a modal or none modal. It is by default visible, but can be made hidden by form logic (java application). Global forms are always hidden. A derived form is a visually inherited version of a base form. It is a subclass of the base form class. Forms can be derived for providing enhaned user experience either by targeting form variations at different groups of users, or merely improving the form layout and functionality for improved usability. The Form Version Selector provides the ability to identify the correct form version at runtime, given a form logical name. A form logical name needs to be resolved to a form class based on an expression that evaluates any run time data such as user or environment properties (practically any data such as user role, locale, context etc). The controls contain a rich set of UI controls which provide generic support for CRM features such as hierarchical choice lists and role based authorization (RBA). 3rd-party controls may also be used, with limitations. 3rd-party controls: Any 3rd party wrapped with Smart Client functionality. Controls provide published API for application scripting. The Binding Framework is the glue module that links the datasets to the controls in a form. It can be easily integrated with any component to provide binding support. 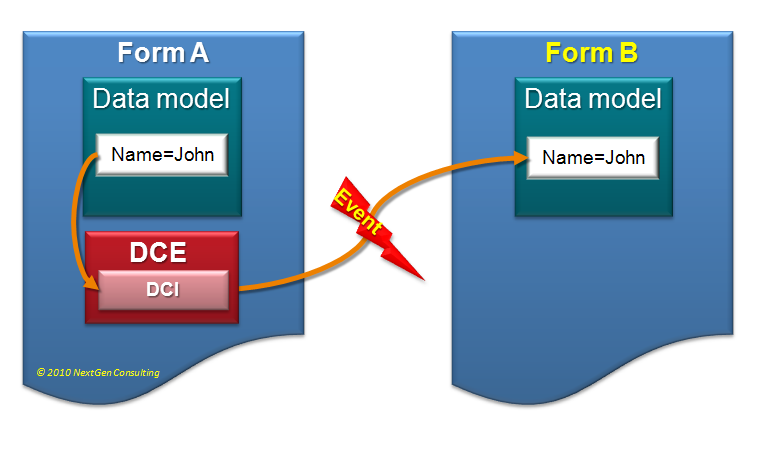 Application events are defined for any change in data model value. Property binding. 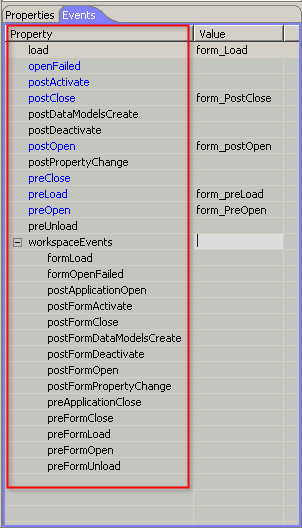 Property binding allows binding a data field to a UI control property other than its value. For example, a data field value can set control property such as visibility, availability (enable/disable) etc. This objects are metadata-driven inter form communication entities applicable between two forms. They provide data transfer (copy by value) and data sharing (copy by reference). The Event manager enables the application layer to establish client side hooks in a technology neutral way and give the ability to execute event hooks in a super class. Validation framework is used to ensure that the user input is valid before it is sent to the server. The cache framework provides ways to cache metadata on the client side that can be used across sessions. Global data manager provides a mechanism to store data sets that can be accessed globally across all forms. Action Manager dispatches actions to event handlers and executes metadata-driven behaviors. Submit actions package the Request payload and process the Response Payload. The actions are built on Swing Action model. An action is a form element with no run-time UI, which performs a metadata-driven action. There are different Action types for performing different type of activities; each has its own metadata format. Any “executable” control, e.g. a button (‘action controls’) can target an Action. If an Action is disabled or hidden, any ‘Action Control’ targeting that Action is automatically disabled or hidden. Since Actions defined in a form and are considered as a form component, they have by default a local form scope (in other words, they can be directly used only by the form’s code). However, an Action may be marked “published”. A ‘published’ action name can be referenced from any other form. Menu and toolbar controls can automatically connect to published actions in the currently active form. When an action is disabled, it automatically disables connected menu items/toolbar controls. Submits request to the server and updates the form with response data; the data is mapped between form’s data models and server side operation (XBean) inputs/outputs (setters/getters); updated data may be auto-broadcast to other forms. Launches new form in ASCF Client workspace; data is mapped between launching form’s data models (current form) and the launched (new) form input data models. Bulks multiple Submit actions in one server round trip, in one or more transactions, or as individual requests with no transaction, across form and its sub-forms, to possibly multiple back ends. Executes multiple actions in a sequence, where the next action in the sequence begins after the current action is fully complete. A subscribing action subscribes to a target action, whose state propagates back to the subscribing action. The subscribing action executes its target when it is executed. The Service Driven UI Action launches forms determined by a backend UI-driving service. It uses Submit action to execute UI-driving service. The UI-driving service determines next logical form. The launch action is used to populate the next logical form name. The launch action properties may be specified by service. The Service Driven UI Action copies input data models to the launched form’s dataset. It supports data context with contained input data models. It can accept multiple explicitly defined Launch actions (one per possible next logical form) along with a default one and it dynamically creates Launch action if needed. Allows any UI control or action in reusable form to trigger flow continuation (overloading). Supports parallel or sequential execution of overloaded control and dynamically created Process-Driven UI action. 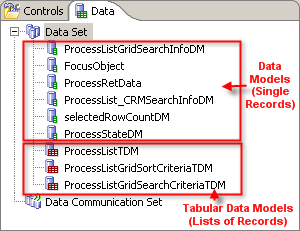 May return any data model to UI-driving service when flow is continued after the UI step. Both SDUI and PDUI can launch the next form according to predefined fields contained in an object named ‘UiDescriptor’ returned by the server. Both can use any business logic as UI-driving service. Both do not restrict the use UI-driving service public API. 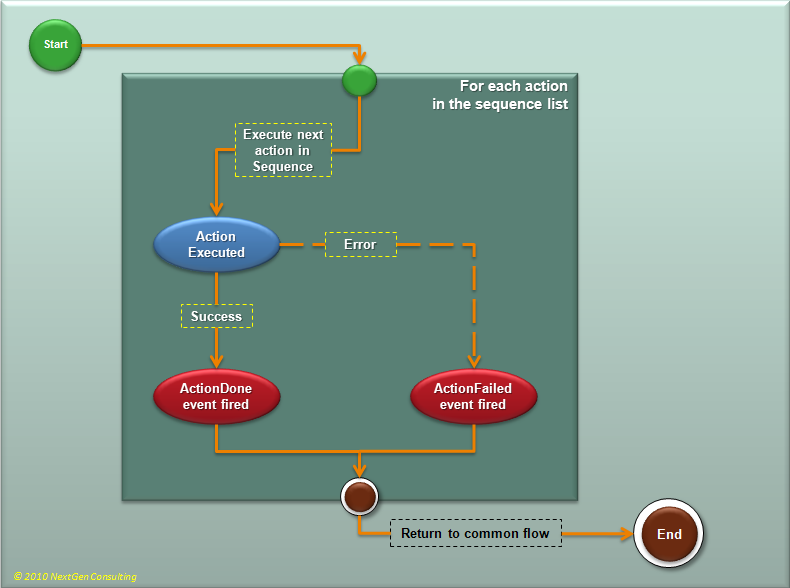 Both action types allow the process state object to have any structure. For both action types, explicitly defined Launch action properties take precedence over Launch properties returned by service. Client Application Connector (CAC) provides services to invoke, terminate and exchange data between other clients on the desktop that include windows based client like outlook, excel etc., a Java based client or a browser based client.